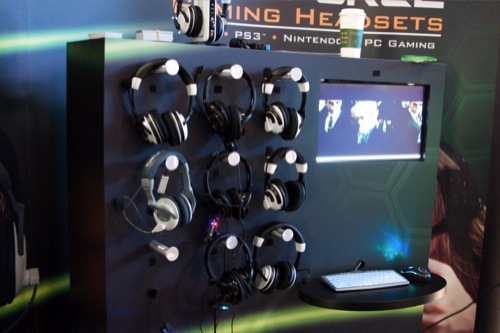 One accessory that seems to be becoming extremely popular are gaming headsets. What's a gaming headset? It's a pair of headphones that offers solid positional audio combined with a microphone for voice communication. Turtle Beach had a few pairs of their latest and greatest headsets on display on the show floor, and I put my ears to the test. I tried out three different pairs of headsets that Turtle had to offer, all ranging in price and features. The first of these was the Earforce P21; these are wired headphones that feature independent volume control for in game audio and voice chat. These work with both the PlayStation 3 and PC. I found them both light and comfortable with respectable audio quality, though they only featured Stereo sound. For PS3 owners these are pretty much your only choice out of the lineup. The MSRP for these are $79.99. Next up is the Earforce X31, which are an update to the X3 headphones. This set works with the Xbox 360 and features wireless RF technology, that means line of sight is not required. Once again you only have stereo sound, though I found it to be a fully rich sound. There's Chat Boost technology as well to help aid in Xbox Live chat to make sure it's clear and crisp - unfortunately I was unable to test this on the floor. These were slightly bigger than the P21's, but comfortable none the less. The MSRP of these are $99.99. The grand daddy of them all is the Earforce X41 headphones. These are once again wireless RF based, but this time you'll hook up a base station. The base station allows analog stereo as well as optical input AND output - allowing pass-through to your receiver. Using Dolby Technology the headsets simulate 7.1 surround sound from the Xbox 360's Dolby Digital 5.1 signal. These headphones were extremely comfortable and not much bigger than the X31. I tried them out with a game of Madden 2010 and the positional audio was astounding. I shouldn't be that surprised as true positional audio is easier to recreate in a closed headphone environment. The headphones also supported the chat boost technology, which sadly I couldn't test. The MSRP? $199.99. All in all I was impressed with the build quality of the headsets. Audio quality seemed passable, though it's difficult to tell on a noisy show floor. I really had hoped to test out the Chat Boost technology - as that's a personal pet peeve of mine. All three headsets are available now in stores. Page created in 0.6170 seconds.